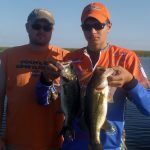 www.okeechobeejust4bass.com was fishing in the afternoon with Randy and Tyler Baird from Knoxville, TN. This was a 4 hour charter with wild shiners under some tuff conditions (no wind). Here is a picture of some of the fish they caught.